I Wondered: Should I Write About 9/11? The phone rang just as I had stepped out of the shower. I was in a rush to get myself ready for a meeting downtown in the Wall Street area, with a stop first to drop off my then 18-month old daughter Leni to the sitters. I hung up the phone, called my sitter to tell her I wouldn’t be bringing Leni over after all and turned on the news. At this point, none of us knew what we’d soon find out–that this was no accident. And, like millions of my fellow New Yorkers, and millions more around the country, and the world, I watched the tragedy, that was just three miles away from me, unfold. This wasn’t happening. It was all too surreal, just like the night before this day had been. I had been on such a high after being a guest at a Marc Jacobs Fashion Week show on September 10th. The non-profit I started, fresh art, which serves NYC artists with special needs was one of the recipients of a generous grant that Jacobs was bestowing upon ten local community organizations. It was one of those only in New York kind of nights–me feeling like what is little old me doing at this glossy fashion show, rubbing elbows with celebrities and models in a beautiful tent along the banks of the Hudson River? Still, I enjoyed every magical moment of it. That next morning, all I could do was watch, and worry. I immediately phoned my, then husband, Tim, who worked for an antiques restorer in Tribeca, just five blocks from the World Trade Center. He didn’t have a cell phone, but I was able to reach him on the business phone. I asked if everyone there was all right, and urged him to come home. He was there with three women co-workers. Tim was trying to comfort them, and get them to leave with him to walk home to our house, since taking the subway was of course out of the question. And, to think I was to be on the train to Wall Street a half-hour after the first plane hit. Tim told me he couldn’t get one of the woman to leave with him. A young Belgian woman in her twenties, her boyfriend, Atsushi, a 31 year-old stockbroker, worked in an office at the Towers. Tim said she could only scream over and over, “Atsushi is dead! Atsushi is dead!” and refused to leave with him and the two other women, saying that she would walk to Atsushi’s apartment on her own soon. After Tim hung up, all I could do was pray for him and his co-workers to get home safely. I couldn’t help but watch the tv, all the while wondering how Leni, playing off to the side of our small living room might be internalizing the horrific visuals flashing across the screen. How can this be? This can’t be real–projections of how many peoples’ lives were presumed lost, hundreds of firefighters running in to save as many of those lives as they could. And when that second tower crumbled like an imploding sand castle, it was all too much. I cried silently, as not to worry my daughter. I only hoped that Tim and his co-workers were far enough away from the towers when the walls came tumbling down. When they did arrive two hours after I had spoken to him on the phone, I hugged all three of them as hard as I could. Yet, there weren’t yet words spoken about what was happening that day. How could there be? We were all stunned, shocked, unable to express ourselves. Instead, Tim and his co-workers, Leni and I ventured outside into our East Village neighborhood to walk to the Korean market to get some food for lunch. Yes, it was the glorious, most beautiful, blue-sky, cloudless day, as everyone recalls–the kind that makes you giddy, the kind of day we had been having for quite a while at the end of that summer. I remember walking Leni for miles in her stroller on those days–so grateful for the beauty of it all, so happy to be walking the energizing streets of my favorite city. As we neared the market, droves of people were walking up Avenue A from downtown, some covered with white dust from the building’s collapse. People almost seemed to be on some kind of high, perhaps, the kind of high of brotherly love when something huge beyond our understanding happens, and we are grateful to still be alive. There were no words, though. We all didn’t know, hadn’t absorbed the immensity. Didn’t know all the facts. Couldn’t comprehend the loss. That glorious blue sky high would fade though. The next day Tim broke down in tears as he sat at our kitchen table. I hugged him and tried to comfort him. He had witnessed too much. He was so terribly sad about all of the people who had died. He wished he had been able to help. We needed to get out of the city. We took the train to Connecticut, to my dad’s that weekend to escape the pain. To breathe. When we returned, we decided to walk home the 35 blocks from Grand Central Station. As we walked down Lexington Avenue, we passed a construction site plywood wall flooded with hundreds of 8 1/2″ x 11″ missing posters. Each one asked if anyone had seen or had information on their loved ones. Have you seen: my aunt, my sister, my fiance, our father, my mother, my nephew? Each one had a name, a photo. I couldn’t bear to look for too long. As I pushed Leni in her stroller, it was as if weighted boulders pressed upon my shoulders. And, then I felt Tim’s hand rest on my shoulder and I knew I was not alone in my grief. The city lost it’s oomph for sometime. Faces at outdoor cafes, on the subway were glum. Every time I passed a fire station with flags and banners commemorating the many firefighters who were lost that day, I nodded in respect to the firemen sitting outside. Tourists weren’t flying to visit us. Our marvelous city felt empty. I had a grants panel meeting a week after the tragedy, at the Lower Manhattan Cultural (LMCC), whose office was in the Towers, and where I had been just a week earlier to be part of a grant awards ceremony. The LMCC was bravely deciding to keep their meeting as scheduled in a borrowed office, still downtown not far from the Towers. I had to take a cab there as the trains were not running past Canal Street. The wreckage still steamed with dust as I passed it by–afraid to look, but unable to not look, if only for a few seconds to see the charred, twisted metal remains. Again, this wasn’t real. This was a movie set, right, is what I wanted to tell myself. I remember some of our friends with children decided right away to move from the city. Most of us remained though. We stayed and got to see the brightness return. The energy of a resilient city and its people did come back. It definitely took the better part of a year, but it came back. 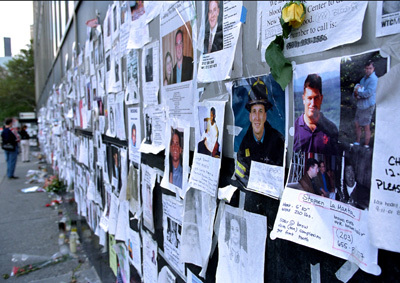 In what feels like a nation with a pre- and post- 9/11 existence, it is important for us to remember, to share, and to honor all of the individuals who lost their lives that day. I am grateful that my former husband and his co-workers stayed safe that day, and grateful that I didn’t lose anyone close to me. I believe through our remembrance, despite the politics that surrounded us post 9/11, we can all do our part, every day, to make the world a better place. Thanks very much, Deborah. I truly appreciate your reading it, and your support. Thanks so much. Thank you for reading. Loved it the fist time and was so well worth a second read! Thank you, Vickie. I really appreciate you going back for a re-read. Oh Wendy! What a heartfelt recollection and tribute. I, too, remember every moment of that day. My Dad and brother were supposed to be having an 8:30 breakfast at Windows on the World on September 11. I spent the traumatic day at school, with my beautiful special children and Fox Point family, desperate to find news of my own family. Father, brother, brother-in-law, cousins, all unaccounted for for hours and hours. I believe that my students saved me that day. Young, unaware and enthusiastic about the joyful beginning of a new school year, they helped me through one of the hardest days ever…wondering the fate of my family. Daniel spent the day at Classical High School wondering, confused, afraid. We later learned that my Dad and brother changed their plans and went to breakfast on Monday morning instead. They, too, “escaped” to Connecticut to be with family. On the train ride, a kind man gave up his seat for my Dad. He started talking to a man next to him, also fleeing to CT. A day filled with surrealism, the gentleman ended up being a relative, a missing link in my Dad’s genealogy. We did lose two young cousins on September 11, one in each of the towers. We lost hundreds of first responders from Rockaway Beach, my parents’ childhood hometown. We lost our innocence. But we gained a new perspective on courage, perseverance, determination and compassion. I will never forget. Thank you so much, Maureen, for reading and for sharing your memories–both scary and hopeful, with me and WJSS readers. That is amazing that your father and brother were going to have breakfast there, and thank goodness changed their plans. I can only imagine you and your family’s worry that day. I remember many friends and family members trying to call us, and being unable to get through for some time. And, just wow, about the man on the train being a relative of your Dad’s! You are so right on when you speak about what we lost, and yet gained. We will never forget. Thank you again–wishing you and your awesome family all the best.